Since moving into my latest Amsterdam flat about a year ago, I have been dreaming about putting the beautiful 5 x 2 meters squared/ South-facing balcony to good use. Last year was a first attempt, and it went quite well. 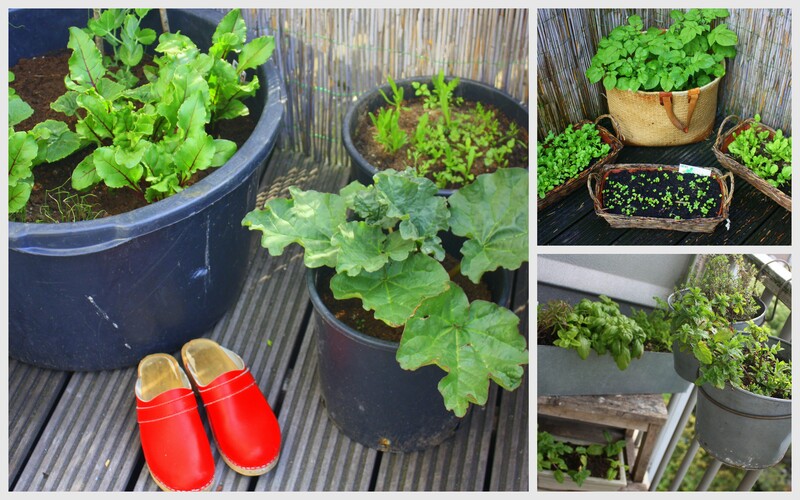 This year, I am curious to know: how much can one really grow on a (albeit, quite sizable) city flat’s balcony? And how much effort will it take? After all, I have two jobs and often travel, for work or pleasure… (I do have a helpful flatmate, but she is also quite busy with work and travels. So who will care for my babies from time to time?) But, if my garden is successful, is this enough to supplement (or at least compliment) going to the grocery store or farmers’ market? Or is it more of a hobby project? Perhaps… a bit of both. Since I move around a lot and never know how long I will stay in a place, I want to keep the investments minimal – for my pocketbook and to reduce my environmental footprint. 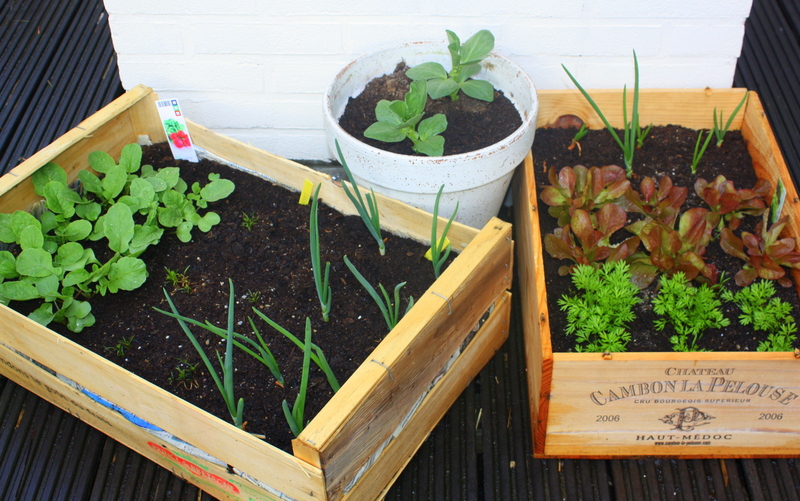 (After all, how sustainable is my garden habit, if I only use it for ones season?) 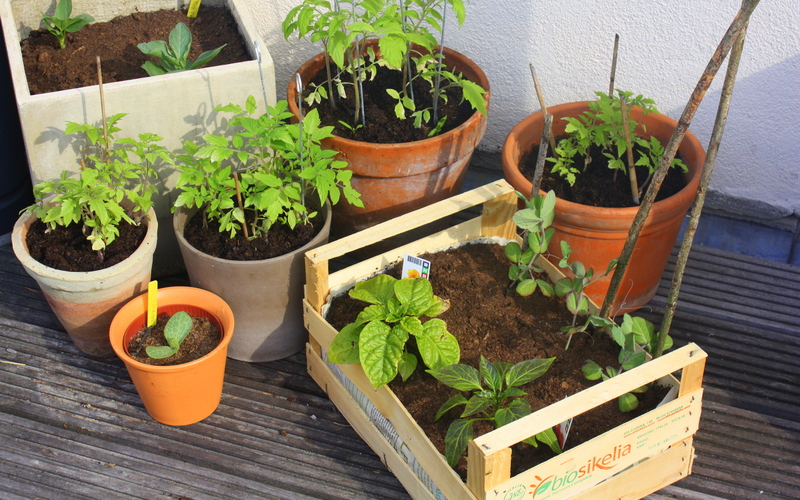 No worry though: in Amsterdam people throw out the funniest things, including many of the pots now on my balcony… the rest of my plant containers consist of veggie crates from local supermarkets. As such, the only thing I have really purchased? A few bags of soil (that I carried up the four flights of stairs), some starter plants, a variety of seeds – and a few gardening courses to help me maximize the space and light (e.g. 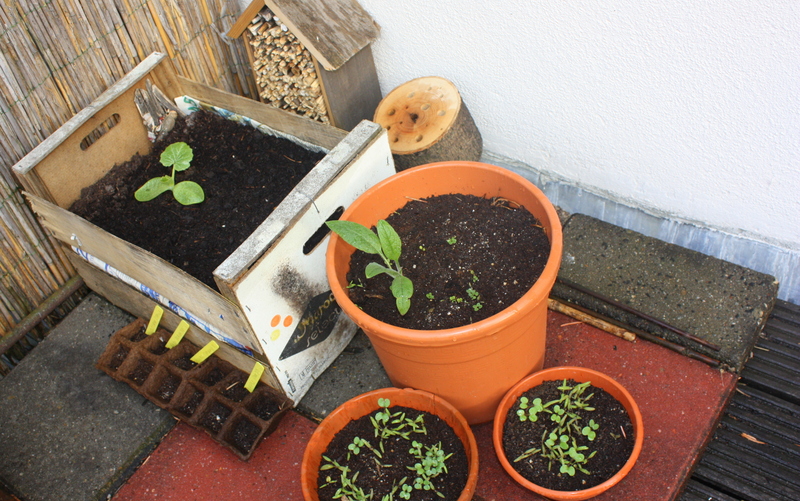 Cityplot’s courses on “urban permaculture“, “worm compost“, “grow your own pesto” and “creating a bee-friendly garden”.) After all, I’ve always had a few herbs in the windowsills… but this is the first time I’ve had enough space to explore so much variety & I have a lot to learn! Now comes the fun part: after the last several months watching (and watering) the seedlings in the windowsills, they are all outside and have started to produce. I’ve had my first few salads consisting of spinach, mixed greens, radishes and pansies. Looking forward to more variety soon, as the garden grows! 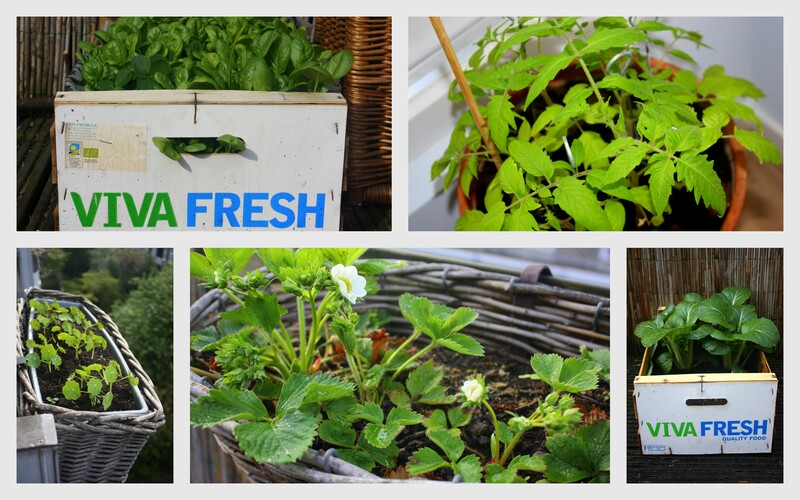 I’ve also come across another great blog with fun receipts for kitchen/ urban gardens… can’t wait to test them out! 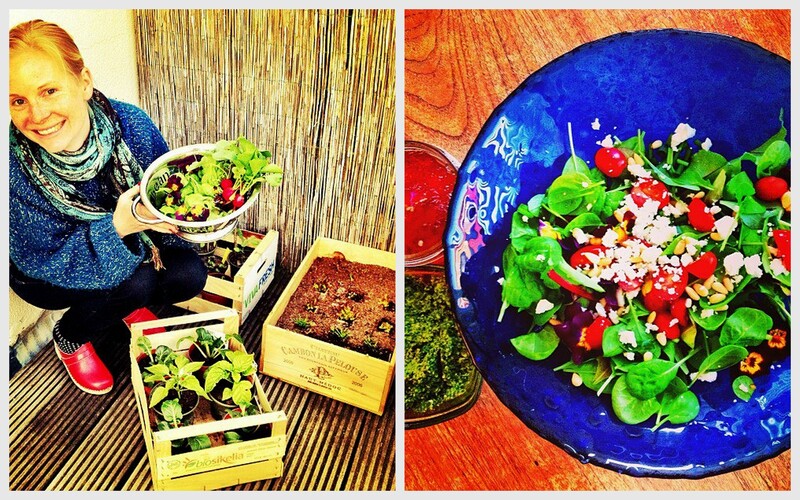 My very first summer harvest, consisting of salad greens & radish-leaf pesto: 2 May 2013! Bottom R: garden herbs, closest to the kitchen and a great addition. Pumpkins like a fair amount of space, half-finished compost & sunshine. They also need lots of space, when their vines start to grow. Wow, Jenn I am so impressed with what you’ve grown in such a short time! That is an amazing amount of food you’re growing, proof that we live in a world of abundance. A few seeds and a little work, and look at what’s possible! You’re giving AH & Aldi a run for their money! Can you talk to one of those many flower shops over there and find out about their business model? I’ve never seen classier flower stands in a city before. I’d love to have a line of “pop-up” flower shops here… yes, pun intended. BTW, I found out about a cool promo in a Japanese city (blanking on the name at the moment, but I will come to it) that allows people with fresh flowers to ride city transport for free – because flowers make everyone happy. Ha! Just hope they are ethically sound flowers, that is – low on chemicals and high on human rights! 🙂 Still, I like the idea!